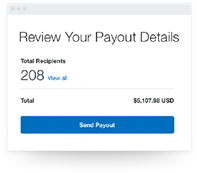 PayPal Payouts, sending payments just got a lot easier. Payouts: PayPal’s mass pay option. Use PayPal Payouts to send money to multiple people at the same time. 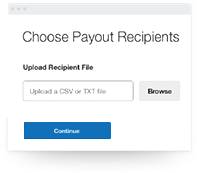 Your recipients can easily receive their funds with a PayPal account. Because there are over 210 million active PayPal accounts worldwide, chances are good your recipients may already have one. If they don’t, it’s easy to open a new account. You’ll need a PayPal Business account. Sending mass payments just got a lot easier with Payouts. Your complete payout history is available online, and you’ll receive a notification when your payments are sent. You can even download transaction details right into your favorite accounting tools. PayPal Payouts supports 24 currencies and 156+ markets around the world. PayPal’s risk and compliance controls help protect you from fraud and offer peace of mind. Send rebates, commissions, rewards, incentives, or any other type of mass payment. There are two ways to use PayPal Payouts. With either method of using PayPal Payouts, you can send up to 5,000 payments at once. Start sending mass payments online in 3 steps. Upload a file that includes the customers’ email addresses or phone numbers and how much you want to pay. Review your payout details before completing your transaction. 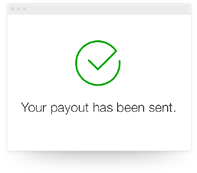 Click Send Payout. Now your customers can collect their money. Or, send money with our robust Payouts API. The Payouts API uses RESTful services, so it’s easy for developers to get it set up and running quickly. Plus, it’s just $0.25 per domestic transaction. Your recipients will thank you. Make their day. PayPal Payouts gets the money to grateful recipients quickly. Recipients get the full amount in their PayPal account to spend or transfer. If recipients don't have a PayPal account, it’s easy and free to sign up. All they need to give you is an email address or phone number. Straightforward pricing makes sending simple. For domestic payments made through our website, the fee is only 2% per payment, capped at $1 USD per payment. For payouts made through our API, it’s just $0.25 USD per U.S. transaction. Questions? Our team is standing by to help. You’ll need a PayPal Business account first. Sign up here.